On the main menu of the DVD select the 'Sewer Dwelling "Special Features" menu entry that will take you to the "Special Features" section. From there highlight the word 'Main' and then press your Left button. A small bone will appear in the mouth of a man in the background. 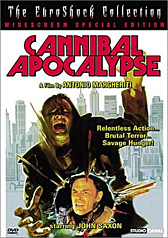 Now press your Enter button and you will get to see an amazing, rare and very disturbing trailer for Cannibal Holocaust.